We are entering into the Internet of things, big data and cloud computing era. Each of these technologies has some bottlenecks such as poor scalability, security issues, and difficulties in installation, fault tolerance, maintenance, and low performance in traditional information technology framework. Hence, we need to leverage each of these technologies to find solutions to other problems. And thus the Internet of things, big data, and cloud computing deal with each other. 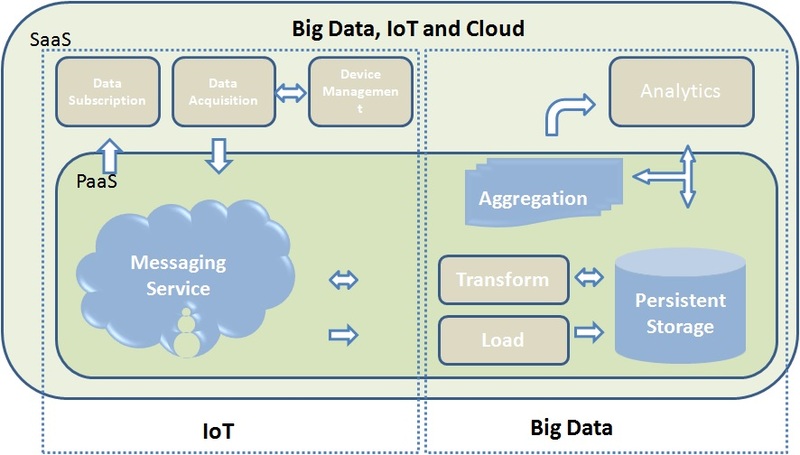 While Cloud computing and Big Data have an inherent connection between them, the Internet of things plays the role of a data source unit. Furthermore, the breakthrough of big data and cloud computing technologies will not only resolve problems but also will promote the wide application of the Internet of Things technologies. 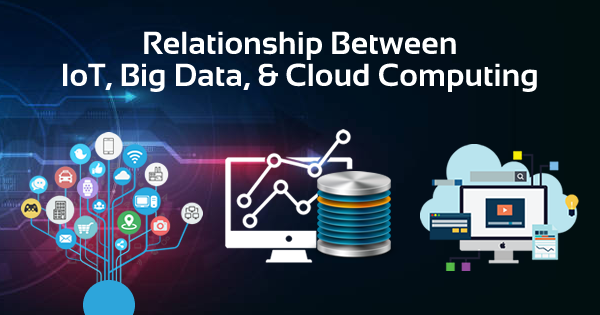 In this blog, we will discuss how these three technologies Internet of things, big data and cloud computing are related to each other. Internet of Things (IoT) refers to a system of connected physical objects via the internet. The ‘thing’ in IoT can refer to a person or any device which is assigned through an IP address. A ‘thing’ collects and transfers data over the internet without any manual intervention with the help of embedded technology. It helps them to interact with the external environment or internal states to take the decisions. 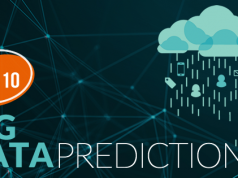 Big Data means a large set (petabytes or gigabytes) of structured, unstructured or semi-structured data and analyzing those data to get the insights of the business trend. The Cloud service provider offers entire infrastructure along with the maintenance related tasks. The Cloud provider offers resources like object storage, runtime, queuing, databases, etc. However, the responsibility of configuration and implementation related tasks depend on the consumer. This service is the most facilitated one which offers all the necessary settings and infrastructure provided IaaS for the platform and infrastructure are in place. With the generation of an enormous amount of data, cloud computing is playing a significant role in the storage and management of that data. 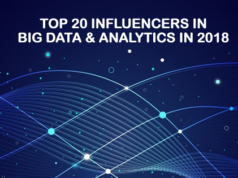 It’s not only about the growth of big data but also the expansion of data analytics platforms like Hadoop. As a result, it is creating new opportunities in Cloud computing. Hence, the service providers like AWS, Google and Microsoft are offering their own big data systems in a cost-efficient manner which is scalable for businesses of all sizes. This, in turn, has led to a new service model which is known as Analytics as a Service (AaaS). This will provide a faster and scalable way to integrate different types of structured, semi-structured and unstructured data, analyze them, transform and visualize them in real time. 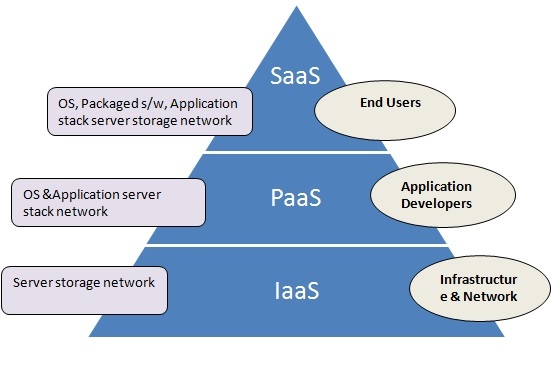 A cloud computing environment usually has several user terminals and service providers. From the collection terminals, the user collects the data using the big data tools. On the other hand, from the service provider end it saves, stores and processes the big data. Hence, cloud computing provides a big data infrastructure. The infrastructure must provide on-demand resources and services to ensure uninterrupted service. Since the cloud environment is scalable, hence it can provide adequate data management solution irrespective of the volume of the data. If the necessary cloud computing service provider can also offer security policies as per the user demands. Identity management and access control are two major concerns while dealing with confidential company data. Cloud computing can meet this security requirement using a simple software interface by abstracting internal details of the information. Additionally, this guarantees complete confidentiality of user data and only provides access to the authorized users. 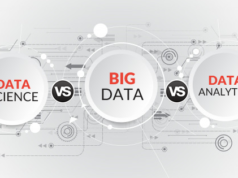 Big data for data processing can be located across the global locations and maintaining such huge servers in different locations is a costly measure for an organization. As cloud computing can store and process data through geographically dispersed and as well as virtual servers it reduces the cost of big data processing significantly. Cloud computing uses high-level software and applications which do not depend on the efficiency of the user devices. Furthermore, it depends on the network servers and their strength. On the contrary, if we use personal resources for big data that will be dependent on the user device. Hence, big data cloud computing service is beneficial. Cloud computing enables high-speed data flow over the network. As a result, it causes faster big data processing. 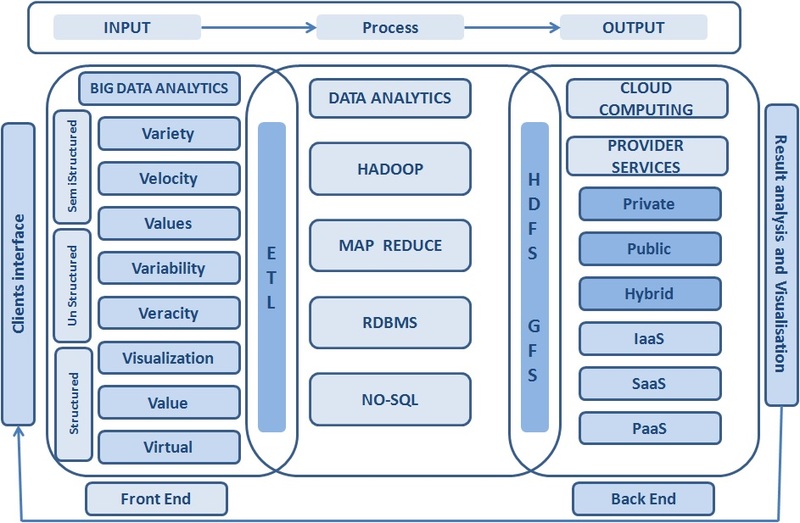 Here’s how Big Data and Cloud Computing are related to each other. The Internet of Things is an opportunity to streamline operations in many sectors to enable interaction between machines and humans (M2H), and devices and machines (M2M). It has enough scope for improvement until now. In most of the cases, sensor-generated data are fed to the big data system for analysis and final reports are generated out of it. Hence, this is the main point of inter-relation between the two technologies. However, it has created many opportunities than challenges. IoT is projecting a future of $19 trillion markets for the internet industry in the next ten years which opens up a scope of more research and development in both IoT and big data domains. In a cloud infrastructure, you can deploy applications to process and analyze data quickly and make decisions as soon as possible. It is estimated that almost 4.4 trillion GB data is going to generate by the year 2020. This is no doubt that it will put a massive strain on its infrastructure. Hence, there is a need to minimize this huge pressure and find a solution to transfer the data. Cloud computing, on the other hand, provides adequate performance and scalability to store and operate such a huge volume of data. IoT and cloud computing has a complementary relationship. While IoT generates large amounts of data, many cloud providers allow data transfer via the internet, that means facilitates a way to navigate the data. Cloud computing helps to collaborate in IoT development. Using Cloud platform, IoT developers can store the data remotely and access easily. Cloud computing helps to advance analytics and monitoring of IoT devices. IoT devices which utilize common APIs and back-end infrastructure can receive important security updates instantly through Cloud as soon as any security breach happens in the infrastructure. This IoT and Cloud computing combined feature is a vital parameter for user security and privacy. Also Read: How are Big Data and AI changing the business world? Hence, from the above descriptions, we can find the inter-dependency between the three mutually exclusive technologies. Here Cloud computing plays the role of a common workplace for IoT and big data where IoT is the source of data and big data as a technology is the analytic platform of the data. An enormous amount of IoT data generation which will feed the big data systems. 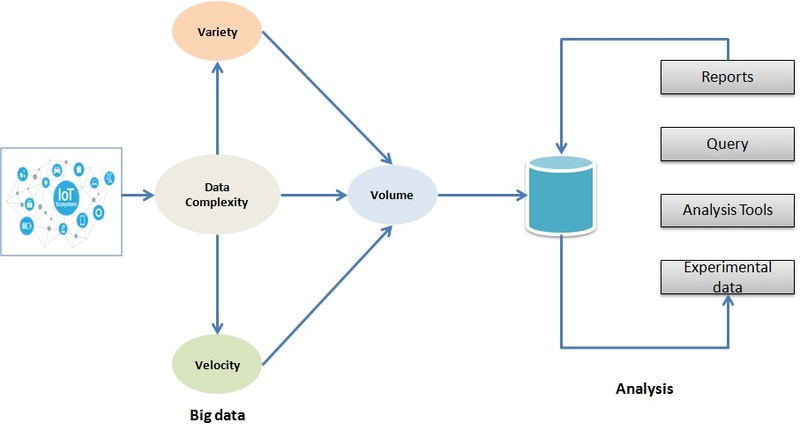 To reduce the complexity of data blending in IoT which is one of its criteria to maximize its benefits. The concept behind it is – if the IoT applications and data operate in silos we will not get the full potential out of it. Hence, to get better insights and to make decisions, blending information (data) from various sources is the best way. Hence, for the above mentioned two points, we see a clear need for embracing cloud-based systems for both IoT and Big Data. This directs towards information-based outcome orientation from product-orientation. To conclude, the convergence of the Internet of things, big data and cloud computing leverage a new horizon of decision support system. Moreover, the convergence of the IoT, big data and cloud computing can provide new opportunities and applications in all the sectors. This will also give an excellent career scope for professionals who are working on the individual technologies currently. At Whizlabs, we leverage the knowledge in the internet of things, big data and cloud computing domain with the market-leading certification guides that will help to obtain theoretical and hands-on knowledge to the professionals. The certification guides have been meticulously designed to assure the success in the actual exams. Hence, join us today to make a difference tomorrow!